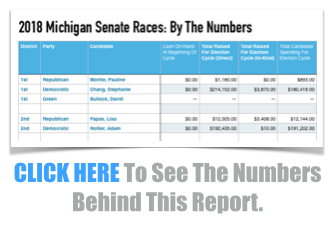 The 2018 Races For Michigan Senate Attracted About 73 Percent More Money Than Before, According To MCFN’s Tracking. Eight Of The 38 Individual Races in 2018 Cost More Than $2 Million Each. LANSING (March 21, 2019) — The 2018 races for the Michigan Senate smashed past fundraising records as Republicans and Democrats battled over control of the chamber for the next four years. The campaigns had it all: expensive primary contests; big-spending super PACs; the image of a lawmaker’s face on a swamp monster’s body; and more than $3 million in dark-money TV advertisements. Those were TV ads that sought to influence voters but showed up in zero public disclosures. 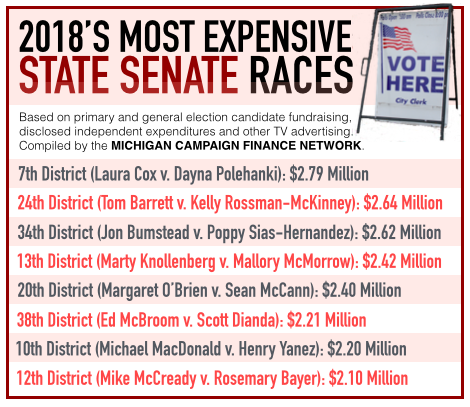 Across the primary and general election campaigns, the Senate races attracted a total of $34.5 million, according to the Michigan Campaign Finance Network’s (MCFN) analysis of candidate-fundraising disclosures, independent-spending reports and TV ad-tracking data. The previous high, according to MCFN’s past tracking, was about $19.9 million in 2006. The 2018 total is up 73 percent over the 2006 total. There are 38 seats in the Michigan Senate. Elected senators serve four-year terms. In 2018, Republicans won 22 of the 38 seats while Democrats won 16. Republicans had previously held 27 of the 38 seats. According to MCFN’s tracking, there were eight individual Senate races that attracted more than $2 million each in 2018. In 2014, there was only one. One reason the 2018 races attracted more money was because there was more competition. In 2018, there were six general election races where the Democrat and the Republican finished within 10-percentage points. In 2014, there were four races where the candidates finished within 10-percentage points. The most expensive Senate race of 2018 happened in Southeast Michigan’s 7th District, where then-state Rep. Laura Cox, a Republican from Livonia, lost to Dayna Polehanki, a Democrat from Livonia. The race attracted about $2.7 million. The Senate Republican Campaign Committee and the Senate Democratic Fund, the main fundraising arms of the two Senate caucuses, combined to spend more than $1 million on the race. 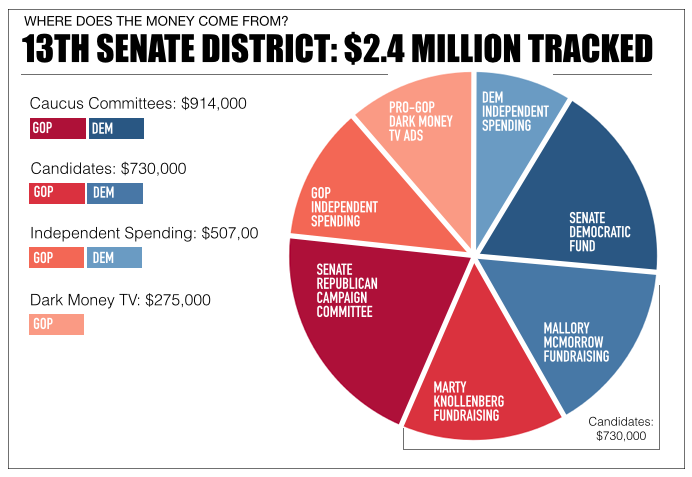 Groups reported spending about $443,794 independently of the candidates to influence voters in the 7th District. And nonprofit organizations spent about $418,000 on TV ads promoting Cox or criticizing Polehanki. Because the ads didn’t expressly tell viewers to vote for Cox, the groups didn’t have to report their donors or even how much they were spending. MCFN tracked spending on ads like those through data from the firm Kantar Media/CMAG and hundreds of disclosures TV networks and cable providers file on political ad sales with the Federal Communications Commission. The 7th District, where Cox and her allies had a $2-to-$1 financial advantage, was somewhat indicative of the overall advantages Republicans had in the 2018 Senate races. Of the 10 most expensive Senate races, Republicans had a financial advantage in nine of them. One of the reasons for the GOP advantage was spending by nonprofit organizations that backed Republican candidates in the races. 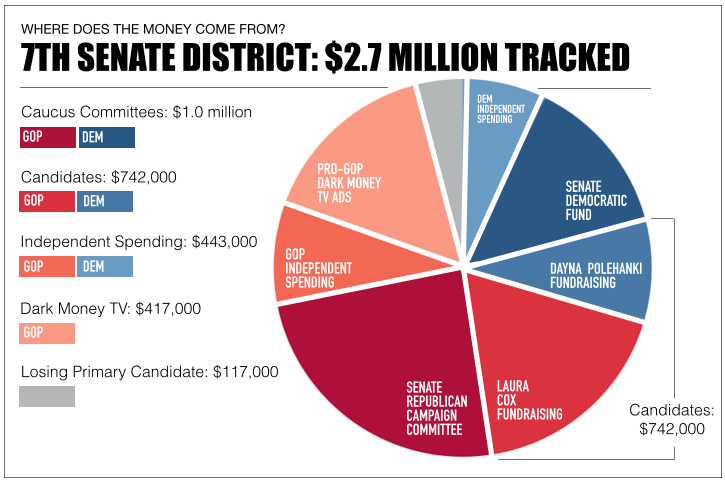 Of the $2.6 million in dark-money TV advertising MCFN tracked in the general election races, only about $756,000 of it benefited Democratic candidates. 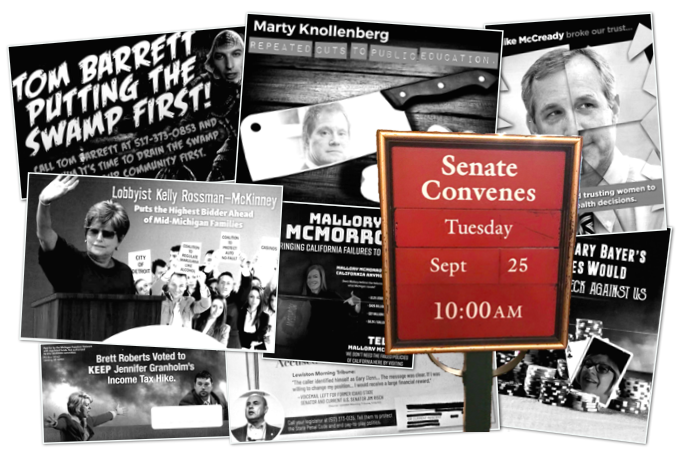 One nonprofit, Michigan Citizens for Fiscal Responsibility, single-handedly spent about $1.1 million on ads promoting Republican candidates for the Senate. The Senate Republican Campaign Committee, the caucus fundraising committee of the Senate Republicans, also had a heavy financial advantage over the Senate Democratic Fund, the caucus fundraising committee of the Senate Democrats. The Senate Republican Campaign Committee collected about $7.4 million from 2014 through 2018. The Senate Democratic Fund collected about $4.8 million over that time. Helping the caucus committees with their fundraising and driving up the cost of the races was the fact that the 2018 election was the first full four-year election cycle in which Michigan’s increased campaign contributions limits were in place. In 2013, lawmakers voted to double the state’s limits, meaning a donor could begin giving $40,000 per year to a caucus committee instead of $20,000 per year. Also, lawmakers doubled the contribution limit for individuals to Senate candidates from $1,000 per cycle to $2,000 and the limit for political action committees from $10,000 to $20,000. The general election candidates for the Senate reported a total of $22.2 million in campaign receipts (direct and in-kind contributions) over the four-year election cycle. For the 2014 cycle, the general election candidates for the Senate combined to report just $14.7 million in campaign receipts, a 51 percent increase in just four years. Which Races Were The Most Expensive? After the $2.7-million 7th District race, the second most expensive was in mid-Michigan’s 24th District, which included a costly GOP primary election and a competitive general election. In the primary, then-Rep. Tom Barrett, a Republican from Charlotte, faced then-Rep. Brett Roberts, a Republican from Eaton Township. The primary race drew about $200,000 in outside spending with utility-connected groups backing Roberts and the Michigan Chamber of Commerce’s super PAC backing Barrett. The primary also saw a group called Michigan for Traditional Values send out mailers featuring Barrett’s face on a swamp monster’s body. Barrett won and faced businesswoman Kelly Rossman-McKinney, a Democrat from DeWitt, in the general election. Through Barrett’s campaign, the Senate Republican Campaign Committee spent $479,787 on the race. The Senate Democratic Fund spent only $35,000. In the general election, the Michigan Chamber’s super PAC spent $155,500 in favor of Barrett. A nonprofit called Bipartisan Solutions ran an estimated $147,000 in TV ads promoting Rossman-McKinney. Across the primary and general election, the 24th District, which was won by Barrett, attracted about $2.64 million. Just behind the 24th was the 34th District, where there were competitive primary contests on both the Republican and Democratic sides. Former Rep. Jon Bumstead, a Republican from Newaygo, narrowly defeated Democrat Poppy Sias-Hernandez of Muskegon in the general election. Overall, the race attracted about $2.62 million. The Michigan Chamber super PAC spent $134,050 independently to benefit Bumstead. The Michigan GOP spent $101,926 independently to benefit him as well. Two nonprofits, Michigan Citizens for Fiscal Responsibility and A Public Voice, ran about $157,000 in TV ads criticizing Sias-Hernandez. Sias-Hernandez received $112,500 in outside support from the Michigan Leadership Committee, which was funded by the national Democratic Legislative Campaign Committee. From the primary election through the general election, dark money — money that can’t be tracked back to the original donors — was a staple of the 2018 state Senate elections. Across both the primary and general election campaigns, MCFN tracked at least $4.01 million in dark-money (about 11 percent of the total money in the Senate races). The dark-money total is the spending on TV and radio advertisements by groups that didn’t expressly tell viewers how to vote and spending by super PACs that took the majority of the their funds from groups that didn’t disclose their donors. The actual total of undisclosed money in the races is higher because MCFN can’t track some spending on things like mailers, online advertisements and billboards that don’t tell people how to vote. For instance, a group called Detroiters for Change ran a series of auto insurance-related billboards and mailers in Detroit-based Senate races. Its spending can’t be tracked at all. One of the most active spenders that didn’t report its donors in the primary was the nonprofit Faithful Conservatives for Michigan. The group ran ads that featured the image of a snake and criticized then-Rep. Gary Glen, a Republican from Midland. The group aired other ads that promoted Glenn's opponent, former Rep. Kevin Daley, a Republican from Lum. The group spent about $443,900 on cable and broadcast TV ads. Faithful Conservatives uses the address of the same Okemos law office as another nonprofit Citizens for Energizing Michigan’s Economy, which has connections to Consumers Energy. Citizens for Energizing Michigan’s Economy spent an estimated $469,000 on ads across five Senate races: three primary races and two general election races. Outside of those groups a series of Republican-backing nonprofits also spent heavily. Groups like A Public Voice, Citizens for a Working America and Michigan Citizens for Fiscal Responsibility combined to spend about $1.8 million on ads criticizing Democratic candidates. The Michigan Democratic State Central Committee spent about $323,000 on TV ads across the 10th and 20th Senate districts that didn’t show up in disclosure reports.